Three kids find out that it really is a Jurassic world this summer as hilarious family animation DINO TIME roars into cinemas from May 22nd 2015 before being unearthed on DVD and digital platforms from June 1st 2015, courtesy of Signature Entertainment. Ernie, his sister Julia and best friend Max uncover the ups and downs of having an inventor for a parent when they accidentally trip Max’s dad’s brand new time machine into action and find themselves flung 65 million years back in time. Landing right in the middle of a trio of dinosaur eggs, the kids are nevertheless surprised to discover they’re not food but family, as doting dinosaurs Tyra (Melanie Griffiths – Working Girl) and Dodger (Rob Schneider – Grown Ups) give them a whistle-stop tour of a land that time forgot. However, with Tyra’s eggs soon to hatch and with two far less charitable dinosaurs (Stephen Baldwin – The Usual Suspects, William Baldwin – TV’s Gossip Girl) on their tails, Ernie, Julia and Max must find a way back to their own time before it’s too late. 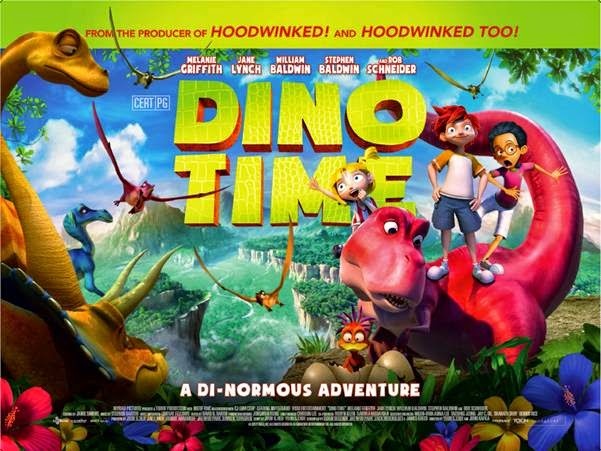 With a stellar voice cast that also includes Jane Lynch (TV’s Glee), John DiMaggio (TV’s Adventure Time) and video game legend Nolan North (Uncharted – Drake’s Fortune), DINO TIME is a bright, breezy, family-friendly antidote to the genetically altered live action dinosaurs abounding this summer, and the perfect half term treat!